McKee's 37 Turbo Car Dryer blasts water out of cracks and crevices to help prevent water spots! McKee's 37 Turbo Car Dryer is a lightweight, handheld car dryer that is powerful enough to blow water off your vehicle, leaving it with a streak and scratch free finish after every wash! Use the McKee's 37 Turbo Car Dyer to dry your entire vehicle, or to simply blast water from cracks and crevices, behind emblems, in between body panels, and anywhere else water can hide. McKee's 37 Turbo Car Dryer features a powerful 6.5 peak horsepower motor that blows filtered air onto your vehicle, making it easier than ever to dry your car while avoiding water spots ' even in direct sun! Modern clear coat finishes are extremely scratch sensitive ' that's a fact. You have to ask yourself this question: does repeatedly rubbing a towel across the paint make it better? What's the opposite of better? WORSE! You can be as careful as can be, but sooner or later you will create micro scratches and swirl marks by repeatedly rubbing a leather chamois or drying towel across your vehicle's scratch-sensitive clear coat finish. Cut down your towel usage with the McKee's 37 Turbo Car Dryer. McKee's 37 Turbo Car Dryer was designed by car guys for car guys (and gals!). Forget dealing with annoying water spots caused by water that was hidden behind emblems and between body panels ' blow it out with the McKee's 37 Turbo Car Dryer. Every Turbo Car Dryer includes various attachments PLUS a 3-year warranty! Water cannot hide from the McKee's 37 Turbo Car Dryer!. Let's get to the specs: First and foremost, we weren't kidding when we said the McKee's 37 Turbo Car Dryer was designed by car guys for car guys. First, the unit packs a whopping 6.5 peak horsepower motor that draws its power from a 35 foot power cord, eliminating the need for extension cords and helping you avoid electrical shock altogether. Second, the air is heated and filtered, meaning you'll never blow dirt, sand or leaves into your precious clear coat finish at high velocities. Third, the 6 foot flexible hose features a vinyl-coated nozzle that will not scratch or mar you paint if contact accidentally occurs. Fourth, the included shoulder strap provides added convenience. Last, but certainly not least, the McKee's 37 Turbo Car Dryer is proudly MADE IN USA. McKee's 37 Turbo Car Dryer is powerful enough to dry your entire car without taxing your muscles. 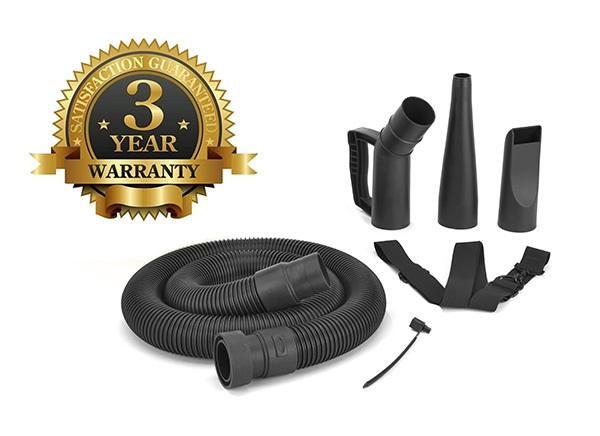 It only weighs a couple pounds, and the 6 foot hose is long enough to reach the roof of most vehicles. If it doesn't reach all the way, the powerful 6.5 peak horsepower motor packs enough of a punch to blast the water off, even if it's held a couple feet from the panel. You'll love using the McKee's 37 Turbo Car Dryer on wheels and tires after you wash your car. Most new vehicles have complex wheel designs where water loves to hide, and we all know there's nothing more annoying than drips of water running down your tire as you apply a coat of your favorite tire gel. Water cannot hide from the McKee's 37 Turbo Car Dryer and its 6.5 peak horsepower motor! Blower 5 The blower does a great job of blowing the water off my truck. It is better than I thought that it would be. Very Efficient Dryer 5 The McKee's 37 Turbo Car Dryer is the best investment I ever made for my SUV. More powerful than I expected, this really makes drying much easier. Good weight and design and not nearly as loud as a leaf blower. Great dryer! 4 I've been able to use it once so far and it worked great! It worked not the way as I expected - by actually drying out the water completely, instead it broke down water droplets into smaller ones which dried-up without any marks, so it it did a great job nonetheless. Cons:At first I've tried to use the rubber tip connected to the hose directly and it came off a few times when trying to hold by the tip. However, when using together with the handle extension it did not have such probelm. Turbo car dryer 4 I am over all very satisfied with quality and how it works. I wish there was a 3rd nozzle option in between the 2 you have. Also changing between nozzles would be easier if they had a quick twist and lock feature instead of a clamp requiring a socket to tighten. Excellent Car Dryer. 5 Very high power, effective and compact. Love it! 5 Bought it as a surprise when he saw it on TV. He loves it! The only thing is now I see it is 178.99 and I paid 199.00 Can I do anything about this. turbo dryer 5 A great tool.A must have for anyone, I recommend it to everyone.I got one for my Mother-in-Law and she loves it also. Pros:Light,powerful, and easy to use. Look Ma - No Hands! 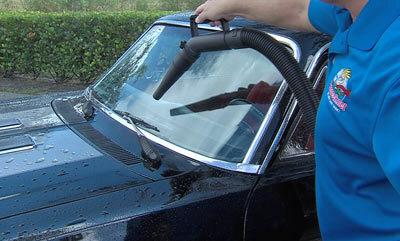 5 This is a great way to dry your truck, especially if you use McKee's 37 Carnauba Wax. It gets the water off the body and saves time and wear on the paint from hand drying. 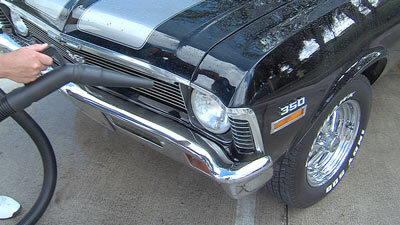 I really like the way it gets all the water off the chrome grill and out from behind the moldings, lights, off the glass wheels and tires. Another great product. Pros:Light weight, powerful and works as advertised. Turbo car dryer 5 Fabulous tool. I have a ceramic coating on car and this dryer, after I wash the car, blows ALL the water off a 2018 Mustang in 7 minutes! Final wipe down is with one microfiber towel and it barely gets wet. With a black car this dryer insures I put NO scratches or swirl marks on the paint. It is everything as advertised and I will be using it for many years. Nice product McKee's! Pros:It is more pricy than a leaf blower BUT worth every penny. Unlike a leaf blower it is designed for the intended purpose. Water mover!!! 4 Really like the Turbo Car Dryer. Unit works great overall. Extra long cord. Cuts down the towel drying time. An idea to possibly try a touch less squeegee blade adapter. To cover the larger areas better. Cons: Once the hose did come off at the handle. More of a positive detente would help. Great 5 Wish I would have bought this a long time ago. So much easier than towel drying and you can actually dry well enough to polish or wax immediately. Works great 5 Says what it does ....does what it says. Plenty of power to blow out the nooks n crannies. Makes detailing a little easier. WOW!!!!!! 5 Should have bought it long ago. No dripping from cracks and crevices as occur after drying with a towel. Fast, Spot-Free, Lint-Free Drying 4 The McKee's 37 Turbo Dryer dries my cars very quickly without touching them and there are no water spots! If the vehicle being dried has a good coat of wax or paint sealant, the water scoots right off. The dryer does a super job blowing water out of mirror housings, grills, wheels, brakes, gaps between panels, emblems, and windshield wipers. In the engine bay, the dryer prevents water spots on my chrome and stainless steel accessories. Unlike towels, the dryer leaves no lint behind and does not become heavy with soaked-up water. The only reason I do not give the dryer 5 stars is because it really needs a backpack carrier like a landscaper's leaf blower. The included should strap is certainly better than carrying the dryer in my hand, but the strap does not maintain the adjustment I set. I unhesitatingly recommend the McKee's 37 Turbo Dryer to anyone who wants a beautiful, shiny vehicle without water spots in the minimum time. Great product 5 Really works well drying the car and getting water out of cracks and wheels. Pros:Does very good job with drying and saves time. I like the the way it save with wheel drying. Pros:Power,Rubberized nozzle and hose,easy to use even for this 70 year old disabled vet. One of my favorite tools. 5 Time is money, and only way to save time is having good tools. I love my Turbo Dryer, I used Sidekick before, but Turbo Dryer is so much more efficient. We install lot of coatings and after the car wash, you need all the surfaces to be dry...now we can speed up the process. And when coated cars come back to maintance, it is so easy to dry them. We are not touching the cars. And we have less chances to marr the paint. Save time and frustration 5 I got this as a gift from my daughters and it is great. Really cuts down my drying time and eliminates the annoying dripping while detailing. Has enough power but is still easy to handle and the rubber cone tip won't scratch paint. Best Car Dryer 5 For the price, this machine can't be beat. Lightweight with a shoulder strap. Easy to get into hard to reach places. 64 1/2 MUSTANG 5 I AM 77 YEARS OLD AND TIRED OF FIGHTING WATER SPOTS. I HAVE BEEN FIGHTING THEM FOR ABOUT 50 YEARS. I DON'T HAVE ONE YET, BUT AS SOON AS I CAN , I WILL GT ONE.